As pre-season draws to a close, thoughts now turn to what lies ahead for 2016/2017 – but also present are memories the highs and lows from the season past. It’s important to look back to look forward, after all. The following is from an article that our 2015/2016 Leinster Cup winning Coach Ali Robinson wrote about her squad for NewsFour, the local community newspaper… have a read, and BELIEVE! Once in a while, a sporting achievement stands out – a special occasion, where the sheer guts and determination of underdogs trumps that of overwhelming favourites against the odds, showing us that it is possible to do the impossible… and so it was last April. The scene was set for a showdown between two clubs; rivals who had fought it out for the first and second spots in their Leinster league division for three consecutive years. Muckross -V- Wicklow league matches were always tense, high tempo affairs – but it was Wicklow who consistently came out on top, remaining unbeaten by any league counterpart. When both clubs were drawn on the opposite sides of the Leinster Division 11/12 Cup, Muckross watched on as Wicklow relentlessly marched on through the rounds, winning by an average score of five goals to nil. Our team navigated their way through to the quarter-finals, and then won a tough semi-final against Monkstown to book their place in the final, which based on form was generally considered to be a fait accompli for Wicklow… but Ali’s Army had other ideas! Nerves were raw; fear, dread and trepidation abounded; but often in the face of the seemingly insurmountable comes clarity. “So what if they have an ex-international on their team? So what if they’ve beaten us consistently for the past three years? So what if no one is giving us a chance?” If we believed as a unit and agreed as a unit that we could be victorious, then we WOULD be victorious. As a Coach, your job is to instil belief – you have to believe it yourself, otherwise there’s no point in turning up. So, once the cup final date was set, two weeks of intensive physical and mental preparation for the MHC 5s squad ensued, and they were ready for battle. The strategy was steadfast – every player knew their exact role to play; and every player believed that if they carried out that role, they would win. For Muckross, there was a beautiful symmetry to this Cup final – the club had last won it back in 1994, when two of the current squad were 13 year olds playing for Muckross Park College; and two players who now play on the Muckross Vets squad were also on that 1994 cup winning side. The pressure was on. It’s one thing to lose a league match but to lose a Leinster Cup final with the weight of club history bearing down was simply not an option. The scene was set in Three Rock Rovers, on Leinster Cup Finals Day. The sun was shining amidst a soft breeze; kits were gleaming, muscles taught, and minds focussed. When the whistle blew to start the match, Muckross knuckled down and got to work. A nil all draw at half time – the strategy was working. There were individual battles being fought all across the pitch, and this was the first time in three years that Wicklow weren’t having their own way with Muckross. In front of a sea of supporters in green n’ white that surrounded the pitch, the squad fought hard for themselves, for eachother, and for their club. Full time – still nil all. Wicklow with everything to lose; Muckross with everything to win. This incredible battle would now be decided by a penalty shootout. The crowd fell silent as the nominated players stepped up to take their strokes. 1-0 Wicklow; 2-0 Wicklow; panic on the Muckross faces. 2-1; 2-2; 3-2; 3-3; 4-4; 5.5. Into sudden death. Wicklow pushed a penalty stroke past the post. Now, one stroke separated the impossible from the possible – could this group of players claim the cup for the first time in 22 years, and with it their place in Muckross history? The Muckross centre-back steps up. She eyes the goalkeeper in front of her; then looks right; then goes left – and rattles the back of the net. Muckross are the winners, and with that win comes a tsunami of emotion, ecstasy, tears, relief; justification of all of the effort, sacrifice and commitment along the way. A unique feeling that is experienced so rarely in life – the pure joy of victory. Their supporters on the sidelines say it’s one of the most powerful performances from a Muckross team that they’ve ever seen! It may not have been the Olympics, or the World Cup, or the Irish Senior Cup – but sport is sport, no matter what level. To the victor go the spoils. MHC 5s claimed victory – defying all the odds, against the run of form, in spite of everyone who had expected Wicklow to romp home. That victory can never be taken away from the squad of 16 on the pitch that day. What Muckross showed to all present and to themselves the power of BELIEF. In sport and in life, believe that you can achieve it, work hard to achieve it and you WILL achieve it, despite the odds. Muckross Hockey Club AGM 2016 – SAVE THE DATE! The Muckross Hockey Club AGM will take place on THURSDAY 26TH MAY at 7:30PM in THE DROPPING WELL, MILLTOWN! There are many different components that keep the Muckross machine in motion – it’s YOUR club, so why not gain an insight into how it operates? As well as looking back on our last season, we’ll be looking forward to the next – and it is crucial to the continued development and success of Muckross Hockey Club that as many members from all levels are involved in the process and have their voices heard. So, SEE YOU THERE! 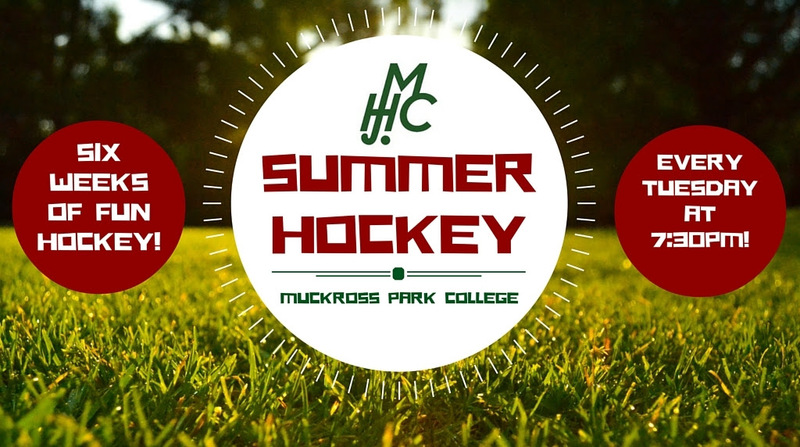 MHC SOCIAL SUMMER HOCKEY SESSIONS will be making a welcome return to Muckross Park College later this month, kicking off on Tuesday 26th April and running for six weeks! These weekly social sessions are a great opportunity for members to keep fit, keep your eye on the ball, and keep in touch during the off-season… everyone who signed up and played last year can vouch that it’s LOTS of fun, and a perfect way to soak up the summer evening sunshine! The MHC Social Summer Hockey Sessions are open to all current Senior Club players and coaches, retired members of the Muckross community, and anyone who might be thinking of joining the club. Matches are played in five-a-side format, and you DON’T have to form your own team to enter – simply sign yourself up as an individual. As as we’ll have players of varying levels of experience taking part, teams will be assigned on a weekly basis to ensure an even mix across the board. The cost of signing up for the six weeks is €40, or €30 for students. So, if you like the sound of the MHC Social Summer Hockey Sessions, then all you have to do is click this link to SIGN UP. We won’t be seeking payment until closer to the time – for now, just let us know that you’re up for it! There was Muckross Magic in the air at the Fun 4s Festival Blitz with Corinthian Hockey Club, Railway Union Hockey Club & Monkstown Hockey Club in Muckross Park yesterday – HUGE thanks to all of the volunteers and parents who pitched in to make it such a great day! Having made it through preliminary rounds of judging, we’re excirah and delirah that this very website is now a FINALIST for ‘Best Sports Site’ at the Web Awards 2015! Here’s the full list of nominees… Fingers crossed for the awards ceremony on Thursday 15th October! GET THE SIDELINE STORY – ADD US ON SNAPCHAT! Muckross Hockey Club is now on Snapchat! We’ve assembled an elite crack-team of MHC Snappers – the best in the business, who shall remain anonymous for now! – and every match day they’ll be bringing you The Sideline Story, starting this Saturday… Don’t miss it, add us now – ID is MUCKROSSHC – g’wan, DO IT NOW! THE BIG GREEN N’ WHITE BREAKFAST, SATURDAY 28TH SEPTEMBER! KIELY’S. SATURDAY NIGHT. BE THERE! We’ve been SO busy with all that pre-season sprinting that we haven’t even taken all of our wonderful new recruits on a grand tour of ‘The Clubhouse’. HOW RUDE. Well, we’ll be putting it right this Saturday 28th September – all Senior Club members, coaches and managers are cordially invited to join us in raising a glass to the new season in Kiely’s of Donnybrook from 8:30PM – see yiz there! WELCOME TO MUCKROSS, IRISH INTERNATIONAL NICCI DALY! We are delighted to welcome Irish international Nicci Daly to Muckross Hockey Club for the 2015/2016 season! We all watched her shine bright at the FIH Hockey World League in Valencia and the EuroHockey Championships in Prague throughout the summer – some of us have possibly even tried in vain to recreate THAT wonder-goal against South Africa on the training pitch! – well, now you can look forward to seeing Nicci in action in green n’ white with MHC 1sts as they make their return to top flight provincial hockey this coming season! With 120 international caps to her credit, Nicci will have an integral leadership role within the squad, and will be utilising her world class skills and vast experience to work with and develop up and coming young players in the club. So, from all in Muckross Hockey Club – welcome aboard, Nicci!